The Wage-Earner Funds in Sweden is one of the few serious attempts in an advanced capitalist society to socialize the means of production. Developed by Rudolf Meidner and Anna Hedborg, two economists at the powerful social-democratic union confederation LO, the plan envisioned a gradual, long-term transition to worker control of the whole economy through regular, continuous transfer of shares to union-owned funds. While it is commonly believed that the plan failed due to intransigent and well-coordinated capitalist opposition, my research demonstrates that its failure was primarily due to the high degree of centralization of the labor unions pushing it. The Meidner-Hedborg Plan (MHP) proposed to gradually and cumulatively transfer control of most companies to organized workers. The plan would accomplish this by mandating most Swedish firms (except those with less than 50 or 100 employees) to transfer a certain portion of the profits every year to the worker-controlled Wage-Earner Funds (WEF), as newly-issued shares. At the report-recommended transfer rate of 20%, it would take around 20-35 years for them to attain majority ownership of Swedish capital by society, depending on the level of profits during the period of transfer. Released in August 1975, MHP was an immediate public sensation; the bourgeois-liberal newspaper of record, Dagens Nyheter, proclaimed “Revolution in Sweden.” The LO-organized mass educational campaign in the fall was met with enthusiastic support from union members, to the degree surprising even to Meidner and Hedborg, which created the momentum and swayed the LO President Gunnar Nilsson to support the plan. At the LO Congress in June 1976, the delegates overwhelmingly endorsed MHP. They concluded the debate by singing the Internationale. But the socialist transformation of Sweden through WEF failed to occur. The dominant explanation of the failure attributes it primarily to political and ideological mobilizations by the employers. Indeed, WEF case is often treated as the quintessential case of impossibility of the social democratic path to socialism to overcome the irresistible wall of capitalist counter-offensive, failing on the shoals of “massive, hostile reaction by the Swedish capitalist class”. However, this interpretation does not portray the events as they unfolded accurately. In 1978 the LO had already significantly back peddled on its more radically transformative original plan, before Swedish capital launched an intensive campaign against the fund. Most instances of the intense business countermobilization, such as the multimillion-kronor anti-fund campaign that the SAF ran during the 1982 election and the infamous anti-fund “October 4th demonstration” of 1983 that brought 75,000 protesters on the streets, occurred after WEF had become moderate and non-threatening to the capitalist relations of production. While this chronology does not necessarily invalidate theories of structural capitalist power to obstruct a democratic socialist transition in general, the Swedish case hardly demonstrates its impossibility for that reason. After the euphoric LO Congress, long negotiations between LO and the Social Democratic Party (SAP) began to unfold. The SAP leadership, having embraced peaceful class collaboration for many decades, never supported MHP. The LO-SAP joint working group developed a new, compromise WEF plan in 1978, which dulled the original’s radical edge. The 1978 plan restricted obligatory share transfer to firms with more than 500 employees, precluding worker ownership in many industries (such as construction, restaurants) dominated by smaller firms. Furthermore, it added the goal of increasing capital formation and investment to the original aim of achieving workers’ power and equitable property distribution, which led to a proposal for the parallel fund to be financed from wage deduction. This further diluted the proposal’s transformative potential. Despite the compromise though, the Party leadership still refused to support the 1978 version. The next WEF plan in 1981, primarily influenced by the SAP’s neoliberal future finance minister Kjell-Olof Feldt, entirely eliminated the obligatory profit-based share transfer. The core mechanism to achieve workers’ majority ownership was now gone. Only the capital formation fund, which could purchase shares on the open market based on cash transfers from both wages and profits, remained. The Feldt Plan took a pro-business turn, primarily focusing on supplying sufficient capital for the industry. A version of it was eventually enacted by the SAP government in 1983. The social democratic leaders took the proposal down a rightward path after 1976, either enthusiastically as in the case of the social democratic party or reluctantly as in the case of the union federation. In my view, this was largely due to the absence of mass mobilizations from below to hold the leadership accountable to the original MHP. Recall that the union base strongly supported it. 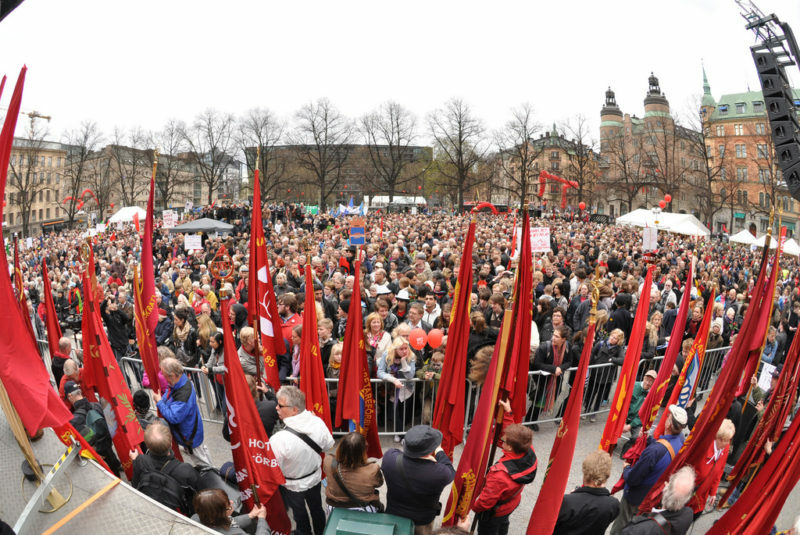 I posit that centralization of the Swedish labor movement undermined both the capacity of pro-MHP rank-and-file workers to actively mobilize beyond passive support, as well as their interest in MHP as a socialist plan. Firstly, the emergence the original plan was not spurred by a significant leftward shift within social democracy, but by the radical and strategically placed left intellectuals, Meidner and Hedborg. The plan did not emerge organically from labor militancy or New Left radicalism, neither of which were significant at the time in Sweden. It came from above, while workers supported it only when they were introduced to it by LO-coordinated study groups. As the party leadership dragged its feet, the grassroots discontent grew; when they rejected the 1978 plan, a widespread expression of discontent erupted from below, as grassroots activists wrote resolutions and newspaper columns to protest the decision. However, there was no independent institutional vehicle from below to channel discontent with the leadership towards mobilizations for the MHP on their own, due to the top-down structure of social democratic institutions in Sweden. Secondly, centralization of the Swedish labor movement cast doubt on the radically democratizing potential of MHP itself. Union ownership of firms would not lead to workers’ democratic control over the means of production, if the unions themselves weren’t democratic. Therefore, the plan awakened little enthusiasm, if not outright skepticism and hostility, in circles further to the left of social democracy. Considering the sheer dominance of social democracy in the Swedish labor movement, these forces were marginal; nevertheless, as militants who were opposed to social democracy, they constituted plausible alternative poles around which the pro-MHP forces could have coalesced. Those who were skeptical of the social democratic leadership were also skeptical of the proposal’s promises, while those who believed in MHP could not openly challenge the leadership in an organized manner. This problem is related to weakness of MHP’s articulation in terms of a broader vision of a transformed society. The plan was clear about its transformative implication, not just economically but also socially. The plan stipulated that dividends be used to provide education in political economy for union members and for expanding cultural and artistic life through the workers’ educational association. They also argued that such empowerment through education was “the most effective counter to any bureaucratic tendencies in the unions,” and that the Funds “will stand or fall with the prospects for raising the level of education among those who one day will assume part of the functions of ownership.” However, not only was the plan oblivious to the existing bureaucratic tendencies in the Swedish unions, it offered no concrete ideas on how the entire society could be transformed as a result of the workers’ control over the means of production. The growing feminist and ecological movements provided an opportunity to articulate it in terms of becoming the linchpin of a whole alternative system of social production and reproduction. But such an articulation did not occur. The debate became too bogged down in complex and arcane technical details that few people understood or took interest in, let alone mobilized en masse to fight for it. If we need today a “left that can learn from 1917 Russia and 1976 Sweden”, what is the main lesson of the latter? MHP failed on the shoals of social-democratic bureaucracy, though it was itself a product of its radical wing. The Swedish case casts a doubt on a sharp, anti-prefigurative separation of the end from the means. Democratization of the economy could not be achieved hierarchically. Today, the politics of worker ownership is back on the agenda. John McDonnell, the Shadow Chancellor of the British Labour Party, announced plans to create “a new workers’ fund for each large corporation, which will place a part of that corporation directly into the collective ownership and control of the workforce.” If such a plan for a democratic economy is to succeed in the post-neoliberal era, it is a matter of political strategy that the movement itself must be democratic, based on autonomous activities of productive and reproductive workers.